Nokian zLine Nokian zLine – Cool Performer Stable, precise, and quietRetains its accurate driving properties in high speed drivingExcellent safety on wet roads The sporty Nokian zLine is a professional in demanding driving conditions, thanks to its new generation of tread compound, nanotechnology layered structure, and tread pattern developed for fast driving. It immediately responds to steering, which is an essential requirement for safe operation at extreme limits. The new Nokian Intelligent UHP Silica: lower heat generation, better wet grip The Nokian Intelligent UHP Silica tread compound developed for Nokian zLine was specially tailored for demanding use at higher speeds. The new UHP tread compound was refined to have extremely low heat generation, maximising the available mileage and ensuring good structural integrity. The rubber compound works ideally along a wide temperature range, thereby improving wet grip that drivers will truly appreciate. The feel of the road is perfect and provides no surprises under any conditions. Tread pattern supports optimal handling The new, modern tread shape of the Nokian zLine perfectly supports the precise driving feel of this high-performance tyre. As in the other Nokian summer tyres designed for fast driving, the tread is of an asymmetrical inside-outside pattern. The rigid inside and outside shoulder area connects with block patterns that are bound together by longitudinal ribs. 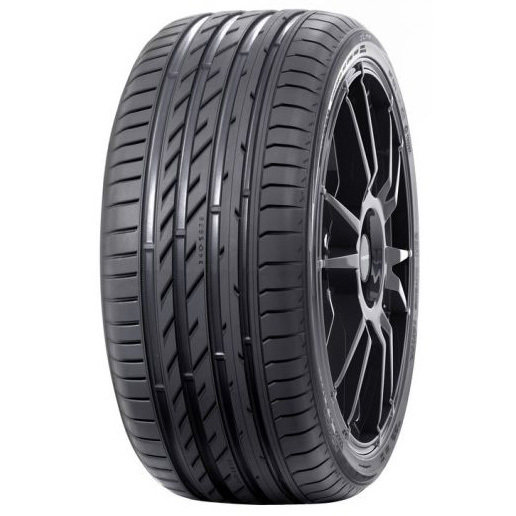 The wide, massive ribs stiffen the tyre and reduce the movement of the pattern blocks during road contact. The longitudinal ribs next to the inner shoulder are dominated by deep lateral grooves that stabilise handling. At the same time, this new Hydro Grooves innovation effectively prevents aquaplaning by storing water from between the surface and the tyre, and by guiding the water into the longitudinal grooves. The innovation ensures a safe driving feel, even in the rain. To combat aquaplaning, separate Swoop Grooves were also shaped in the transversal main grooves on the outer shoulder. More driving comfort and durability The semi-circular indentations, reminiscent of a golf ball, on the walls of the transversal grooves provide additional driving comfort for the Nokian zLine. This Silent Groove Design innovation reduces the interior noise and external rolling noise of the vehicle. Even motorists who are used to higher speeds can rely on the Nokian zLine for years of service, even as the tyre gets older and wears down. The extremely stiff steel belt pack, designed for fast Central European roads and combined with a double body structure, is made of high-strength steel wire. The tough, durable Nokian zLine is sure to work well even on poor road sections. A new rim guard provides additional protection for the edge of the rim. New groove depth indicator and info area As before, the tread surface is equipped with a Driving Safety Indicator (DSI) patented by Nokian Tyres. The new introduction is that the DSI has been made easier to use than ever before. The numbers indicating the groove depth and the water drop symbol indicating a risk of aquaplaning have been rotated to be immediately visible to a driver inspecting the tyres installed on a vehicle. The location and pressure indicators on the sidewall information area of the Nokian zLine improve safety. The information area allows for recording the correct inflation pressure and installation location during tyre change. Safety is improved further by a new section that can be used to record the tightening torque of bolts for alloy rims.